Place the toothbrush next to the teeth at a 45-degree angle and gently brush in a circular motion - not up and down (this kind of motion wears down the tooth structure and can lead to receding gums, or expose the root of the tooth). Brush all surfaces of the teeth - front, back, top, and between other teeth, rocking the brush back and forth gently to remove any plaque growing under the gum. Don't forget the other surfaces of the mouth that are covered in bacteria - including the gums, the roof, and floor of the mouth, and most importantly, the tongue. Brushing the tongue removes trapped bacteria and other disease-causing germs and also freshens breath. Remember to replace the brush when the bristles begin to spread because a worn toothbrush will not properly clean the teeth. Effective brushing usually takes about three minutes. 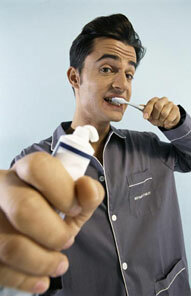 Believe it or not, studies have shown that most people rush during tooth brushing, spending less than a minute.